Opening the Sky: Travels with Camels! My dad trying to talk to a 'camel whisperer' from Sudan. Going to the San Diego Zoo as a young child, I always had to stop and take a peek at the camels--whether they were the dromedary (one hump) or bactrian (two hump) variety. Camels, with their spindly legs, bubble eyes, long lashes, and winsome grins, in my innocent experience, only belonged in zoos. However, while living in the Middle East, one can observe they are ubiquitous in paintings, sculpture, road signs, fairs, and even alongside the highway (fenced in a pen). 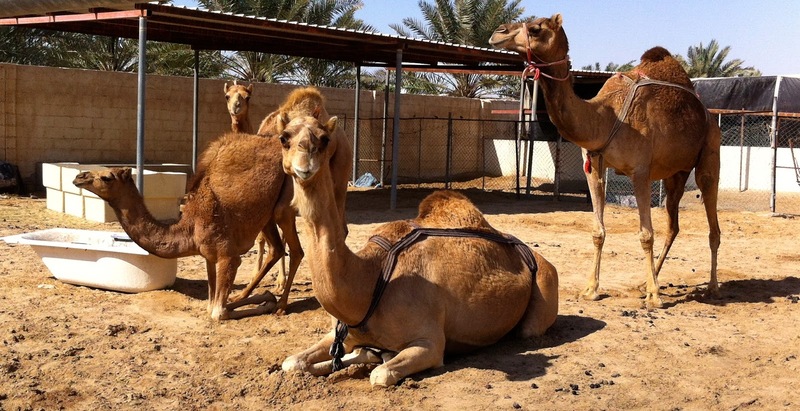 But the camel racing season in Qatar from November to February takes the camel spotting to an entire new level. The 'camel whisperers' off to train their camels. It is a singular experience to be surrounded by camels, with riders from all over the world, elegantly hoisted behind the one humped dromedary. Early in the morning you can stand in the sand, alongside the tracks, as caravans of camels pass by--shouting greetings and encouragement to the 'camel whisperers.' 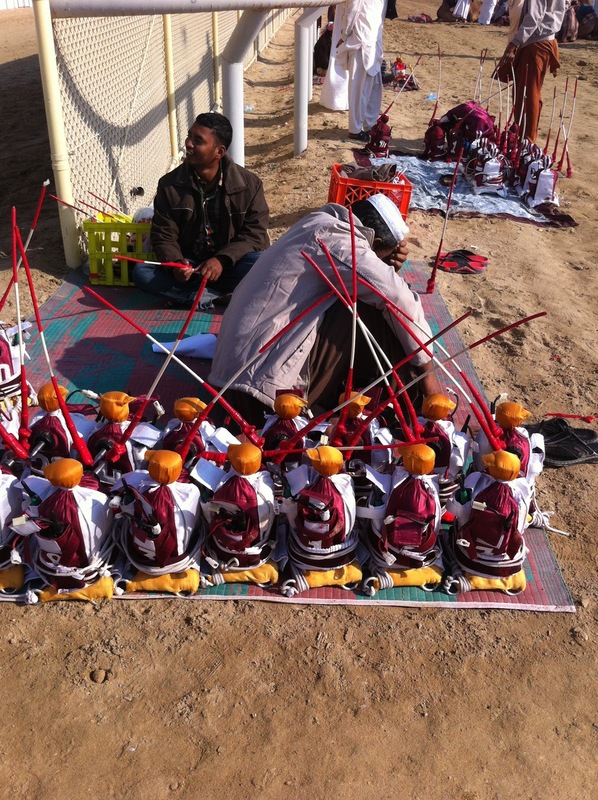 In the past there were human rights allegations for underage jockeys, but in 2005 Emir Hamad Al Thani of Qatar issued a ban on all child jockeys, and pronounced camel races would be directed by robots. These are the robots that the camels wear on their backs as they race. Imagine yourself standing next to the caravans with hundreds of camels sauntering by--off to the race track. It almost makes you feel like you are traveling on the Silk Road many centuries ago or a character in The Arabian Nights. There are seemingly hundreds of camels and their riders; it is a national sport here, as it is in Bahrain, UAE, Egypt, Mongolia, Pakistan, Jordan, Oman, and Australia. Few ' camel whisperers' speak any English, but they all hold up their thumbs, and wave as they saunter by on the camels, perched behind the hump. Young 'camel whisperers' off to train the camels. 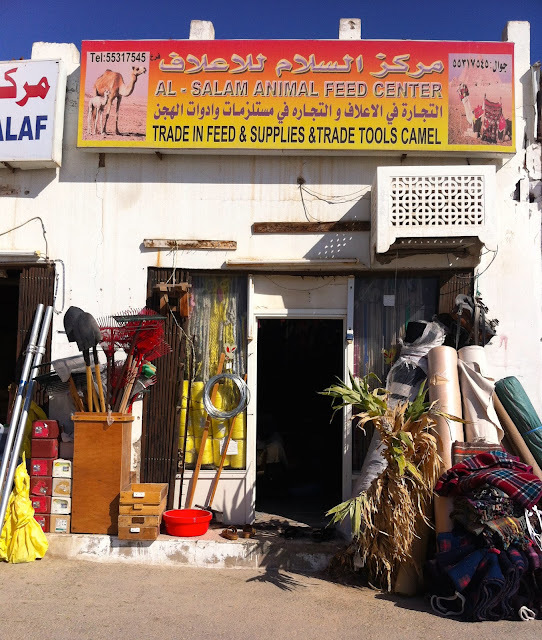 Feed Store for the camels out by the racetrack. 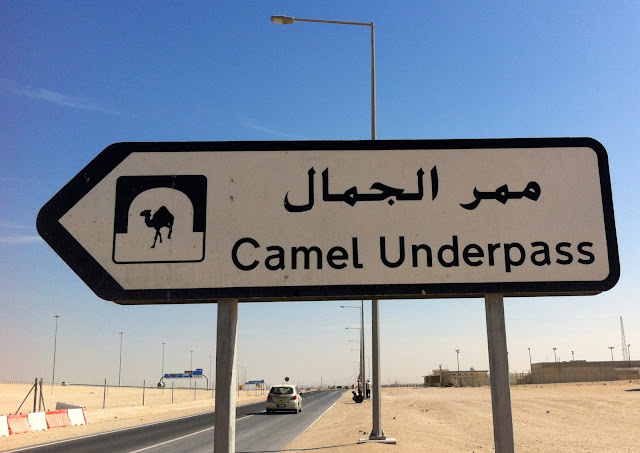 There are camel veterinarians, seamstresses that make their mouthpieces, and even a Camel Race Grocery Store. In the early morning the camels are being trained--meaning they trot around the track, often times with younger camels next to them, showing them their future. The camel tracks are very long ovals (4km-6km) so there are just a few seats to watch the races--no large grandstands. Just imagine three concentric racetracks next to each other, with the camels in the dirt racetrack in the center. The camel owners are in their SUV's racing alongside their prized camels, and the outer track is for the spectators who are driving along side the track--trying not to crash into one another as they watch the camels run the speed at 65 km/h or 40mph in short sprints. They can maintain a speed of 40 km/h or 25 mph for an hour. My childhood intrigue with camels continues here in Qatar. To bounce along on a camel in the desert have been some of my most magical moments in the Middle East. A trek, a journey, a chance to travel... maybe I was meant to be a sojourner. But to travel with a camel, in my opinion, means you are doing it in style! Camels on their training track. 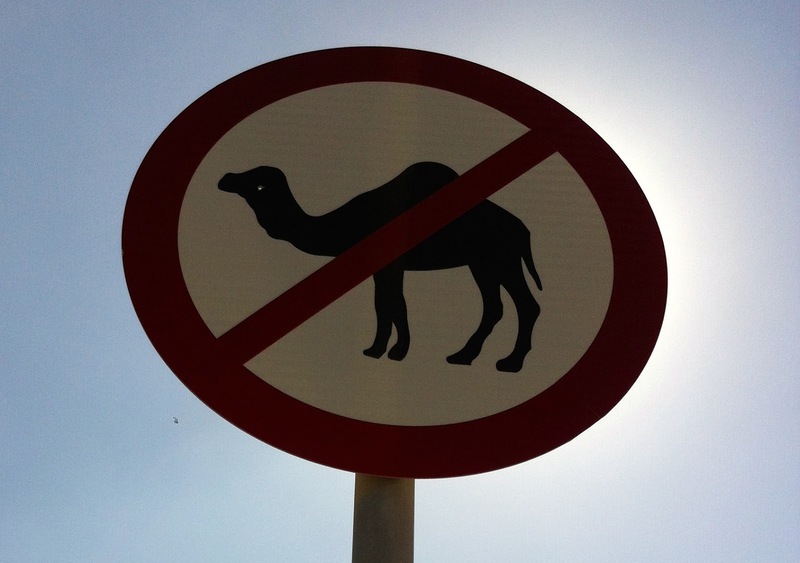 Beware of camel caravans on the road in Qatar! 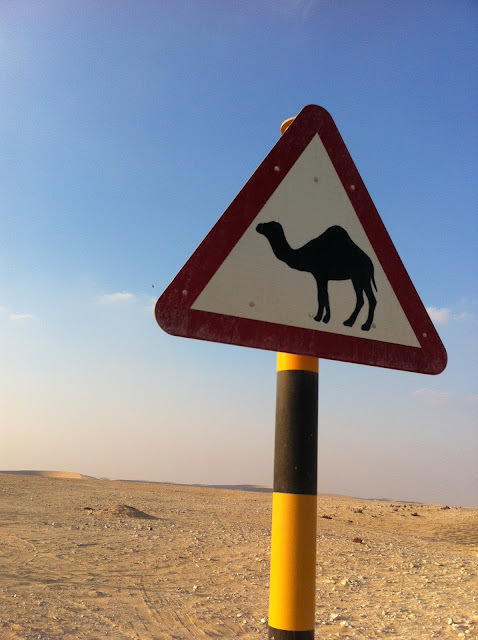 There are only a few countries in the world that have road signs for drivers to warn them about camels! My mom and dad at a museum with a Bedouin tent, and a fake camel in the background. Camels can drink 30 gallons of water in about 13 minutes. I am sure the Bedouins toted immense amounts of water in all their travels. Every day I pass a camel farm when I take my son to school, right here in Doha. At this particular sighting, one of them seemed to be slow dancing back and forth to music. It is hilarious when all of them in the same pen twist their long, angular necks to look your way, batting their long eyelashes, and unabashedly stare at you. They have no sense of propriety that the stare was little too long. Ha! My personal favorite logo here in Doha (from the post of 'An Event or Rare Extraordinaire).